Why won’t my okra pod grow? My okra flowers okay. But when the flower falls off, I see the pod but it does not grow. The flower actually turns into the Okra pod. They do like their soil warm. They can tolerate drought conditions and should only be watered once a week. Damp weather can cause fungus on the plants. They do not like to compete with weeds. Okra can be side dressed with fertilizer once or twice during the growing season. The first application should be timed with the blooming to give the pods a boost, if you have a long growing season you can fertilize again 6 weeks later. Do not over fertilize as this will cause excess leaf growth and few pods. This leads me to wonder if you have over fertilized or if the Nitrogen in you soil is out of balance. Phosphorous may be lacking. Bone Meal is a good way to correct that. Also pollination can be an issue. This could cause the pods to stop forming. I'm listing a few links for you. 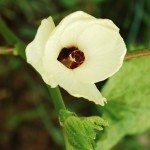 The link about hand pollinating peppers will apply as the technique can be used on your Okra plants.